This page covers the fighting by the German Panzer Army to cut off the US First Army breakthrough advance by pushing through to the coast in August, 1944. There is a short description of the places and sites to see at the top of this page followed by a more detailed explanation of the history of the battle and where the sites fit in to it overall. Following the successful advance of the US VII Corps in Operation Cobra on July 25th, Hitler personally ordered a German counter-attack. This Operation, which he code named "Operation Lüttich", was to cut into the side of the 'neck' of the corridor through which American troops were now pouring into central France. 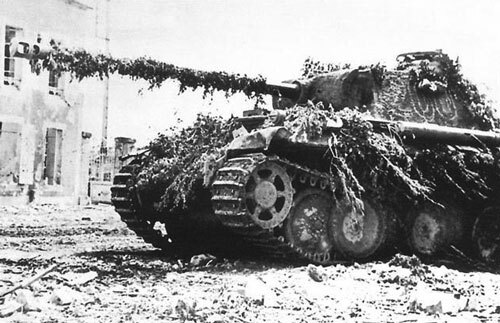 Hoping to cut these advancing troops off from their resupply and defeat them, Hitler's General in Normandy protested that launching this attack would cause the complete collapse of the front as the Germans did not have any tanks to spare. The tanks needed would have to be taken from units that were already using them in the front line and with the now constant Allied pressure all along the German front this would only further weaken the German front everywhere and cause more holes to develop. 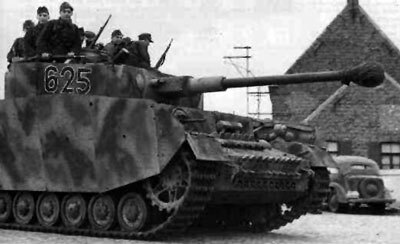 Despite this Hitler refused to change his order and the required tank forces were withdrawn from the Anglo/Canadian front and sent west towards Mortain. As Hitler's Generals had predicted, this withdrawal of German armour from the eastern Normandy side of the front precipitated the start of the rapid Canadian push south to link up with the American forces. This link-up would finally seal the gap between the two Allied Armies and result in the Death and Destruction in the Falaise Pocket of the trapped German Armies there. 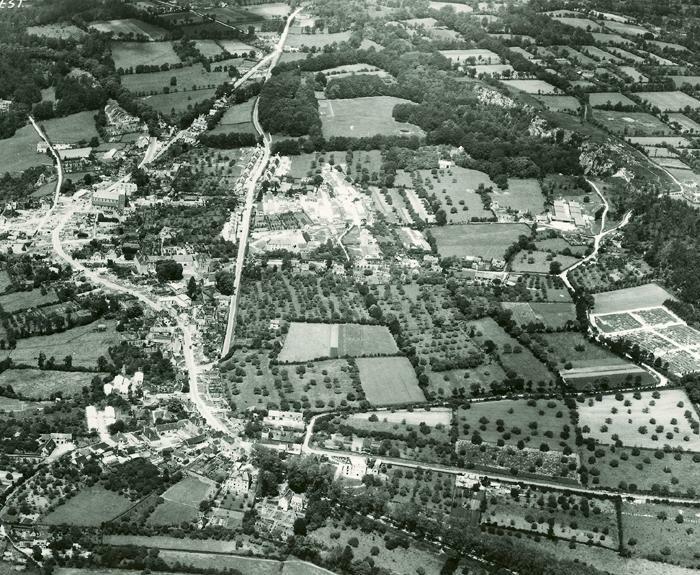 By the summer of 1944 the Allied codebreakers were able to decrypt German radio messages almost as fast as the Germans could read the messages themselves, so General Bradley was tipped off to the German intentions in advance. However, with Hitler's call for speed in launching the attack he only had time to move one Division, the US 30th Infantry, into the path of the attacking Germans before their lead tanks smashed into the hastily constructed US front lines. 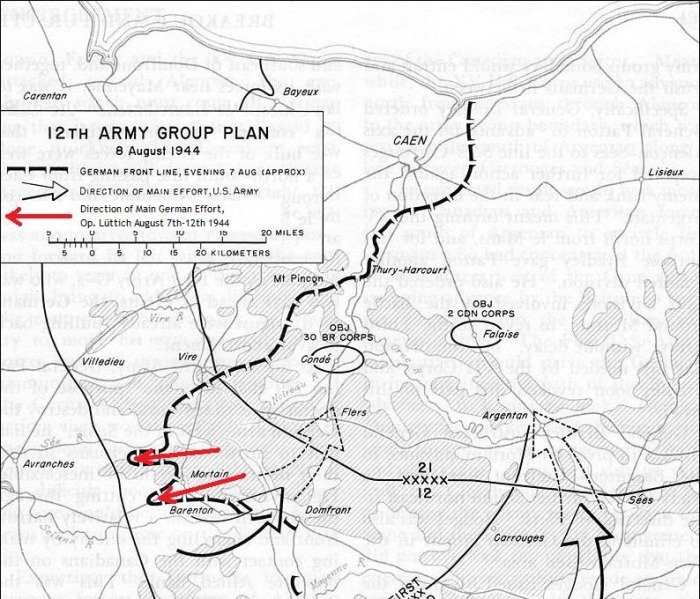 Although pushed back to the west, the defending US forces didn't need to destroy the attacking Germans, just hold them up long enough for Patton's forces, now racing east and north, to link up with the Canadians coming down from Falaise. This would ensure that it was the Germans who were the ones who would finally be encircled and cut off, and this enemy armour could then be destroyed at leisure by Allied aerial attack until those remaining German forces chose to surrender. 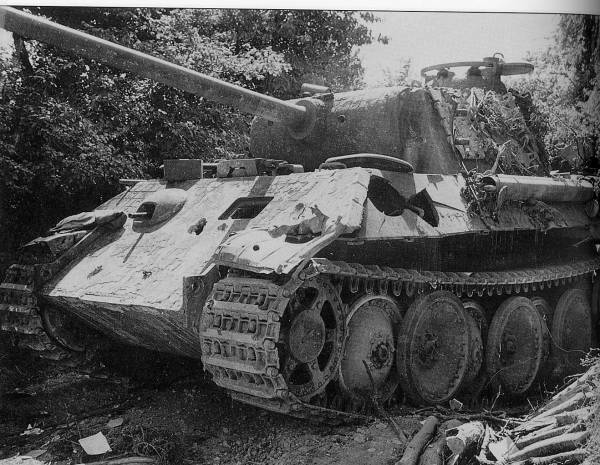 This strategy combined with the severe hampering of German armoured movements due to their critical fuel shortages together contributed hugely to final defeat the German Army in France. See the town that the German counter-attack pivoted on as they tried to cut-off Patton's headlong rush in every direction across central France. 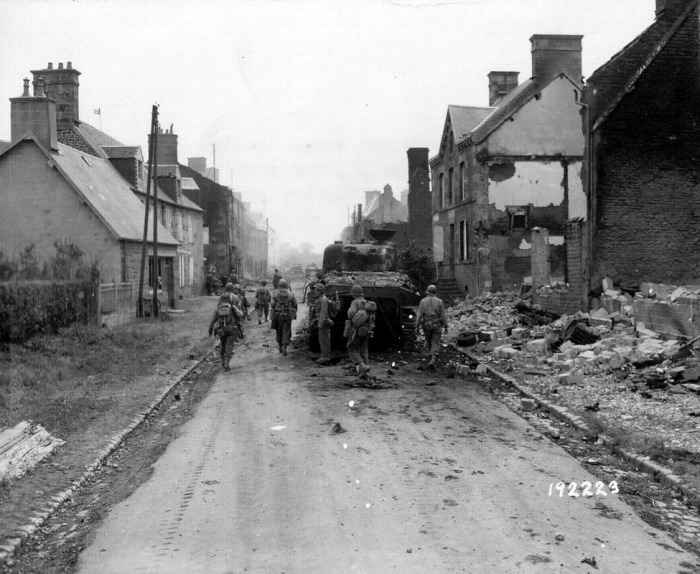 The follow the advance route of the 2nd SS Panzer Division as they captured the town in 1944 in their last-ditch attempt to avoid the total collapse of their front line in Normandy. You will see the battle-scarred buildings in the town still showing their evidence of the savage fighting that took place here. Then follow on the advance route out of the western side of the town and on towards Avranches where the Germans would have finally sealed the American breach of their lines. But you will stand at the furthest positions reached by the attacking German forces before they were brought to a halt by the American defence, within sight of town that was their goal. A battalion of the 30th Infantry Division was cut off on the steep sided summit of Point 317 above the town of Mortain as the 2nd SS Panzer Division advanced through the town around the base of the escarpment. Despite being cut off for five days, the battalion refused to surrender. 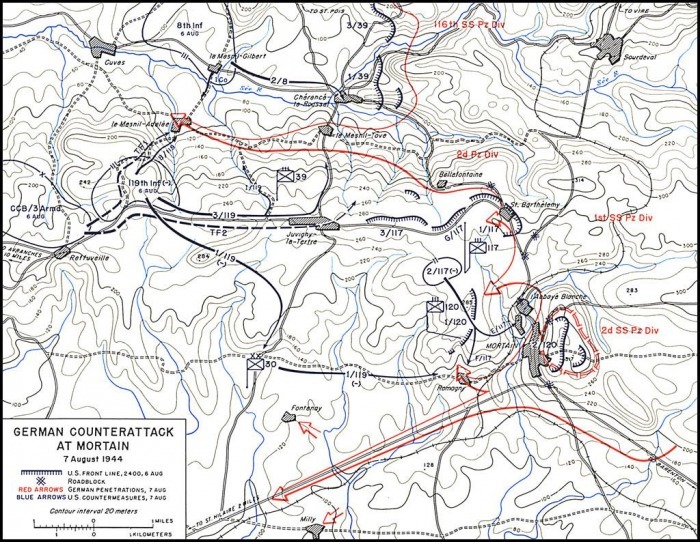 Constantly calling down Allied air and artillery attacks on the massed German armour on the open plains below, the Germans repeatedly attacked the battalion but were unable to dislodge them from their positions. But the Americans problems were not only caused by the German attacks. They had run out of medical supplies, batteries for the radios and were seriously low on ammunition. 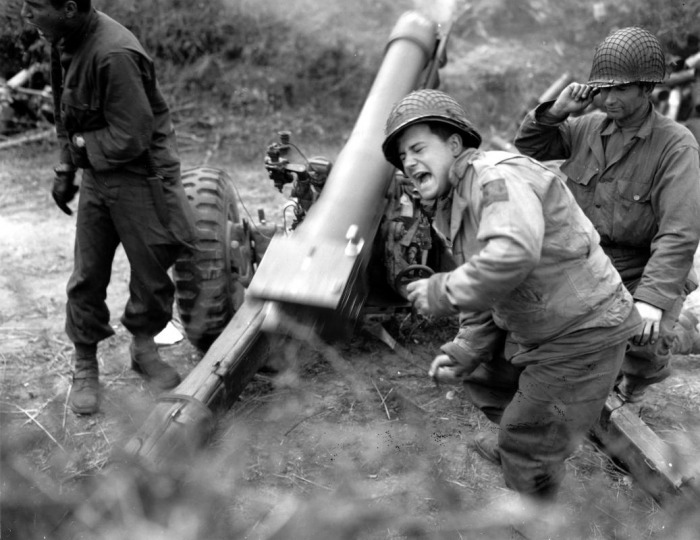 Despite remedies as desperate as firing blood plasma to the trapped soldiers in 155mm artillery shells, the soldiers showed their resourcefulness, holding their positions until the German counter attack was finally beaten off. Here you will be driven up to the top of Hill 317 to see the positions occupied by the 'Trapped Battalion', shown the panoramic views the American artillery observers had of the roads being used by the attacking German Armoured columns, and the importance this small group of men had in stopping this desperate last-ditch attack to stop the Allies breaking out of the Normandy perimeter.